The 'Land of Hope and Glory' hitmaker is to mark the milestone birthday by releasing new album 'Vera Lynn 100' on March 17, making the centenarian the only musician to release an album. Vera said: "It's truly humbling that people still enjoy these songs from so many years ago, reliving the emotions of that time. "I was after all just doing my job as a singer and it's so wonderful for me to hear my songs again so beautifully presented in a completely new way." The record features collaborations with popular tenor Alfie Boe, on 'We'll Meet Again', Alexander Armstrong on 'White Cliffs of Dover' - which Vera reached number one with in 1942 - and Welsh choirboy Aled Jones on 'As Time Goes By'. Vera also pays tribute to her late husband, Harry Lewis, with moving track 'Yours' - which was also number one in 1941 - as the RAF Squadronaires, which he was a founding member of, feature on the song. There will also be a 100th birthday celebration concert to mark the special occasion, the '100: A Tribute to Dame Vera Lynn', is to be held at the London Palladium on March 18. 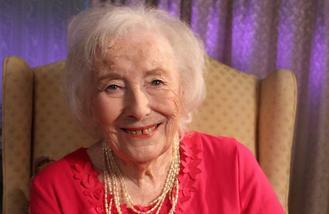 And BBC2 will air the 'Happy 100th Birthday Dame Vera Lynn' documentary on the same evening. Last year, Vera was mentioned in the Queen's 2016 birthday honours when she was made a Member of the Order of the Companions of Honour - the first person from the field of popular entertainment to do so. She was "surprised" to be named a Companion of Honour. The entertainer said: "I felt very greatly honored to be given a Damehood and never expected to receive anything else. So for Her Majesty to bestow a further accolade on me is very unexpected and I feel even more honoured." The wartime singer became the oldest living artist to land a UK number album In her early 90s. 'Vera Lynn 100' is the star's first record since 1984's 'Vera Lynn Remembers'.